Meanwhile, in 12-inch nonstick skillet, heat olive oil over medium-high heat. 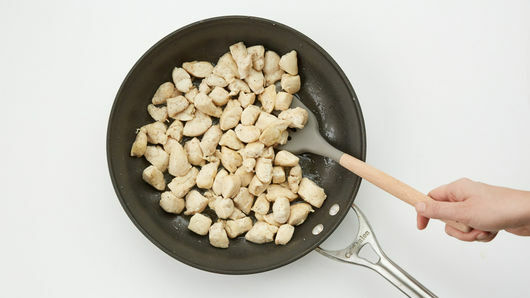 Add chicken, salt and pepper; cook 6 to 8 minutes or until chicken is no longer pink. 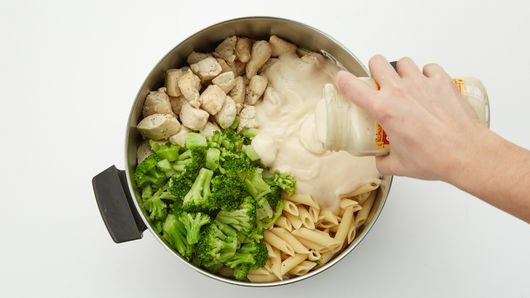 Add pasta, broccoli and Alfredo sauce; carefully stir until well blended. 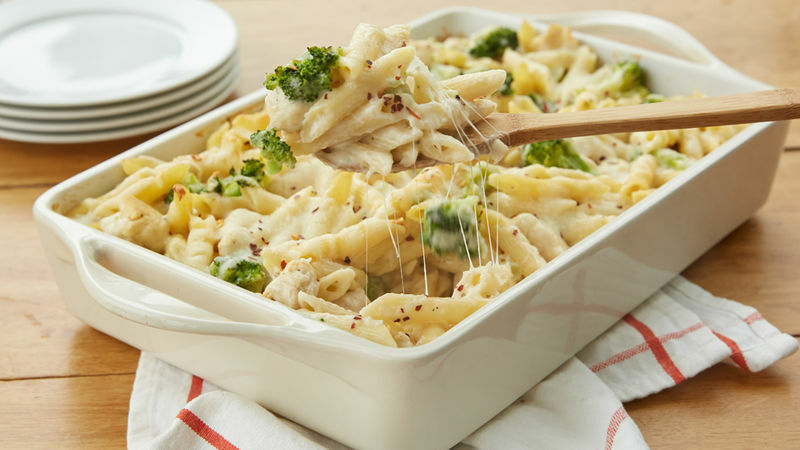 Spoon pasta mixture evenly into ungreased 13x9-inch (3-quart) glass baking dish; sprinkle with cheese. Put a pot of water on to boil, then sauté the chicken and add other ingredients as the pasta is cooking. As your chicken alfredo bake warms in the oven, you can toss a salad or slice some Italian bread. Dinner is served! 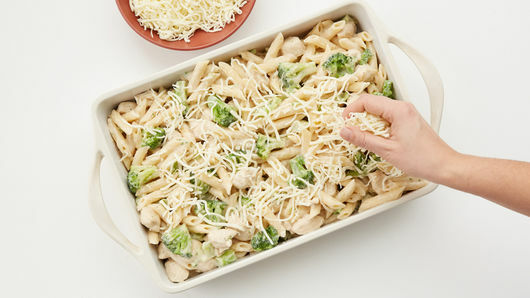 As you spread the pasta-chicken mixture in the baking dish, move chicken and broccoli chunks around to be sure they’re evenly distributed. Baking the casserole is really just to melt the cheese and allow the flavors to meld. For an even more authentic Alfredo taste, add some shredded Parmesan cheese with the mozzarella. Place out a small bowl of thinly sliced fresh basil or even dried leaves to sprinkle over each serving, along with freshly ground pepper. Chicken Alfredo or fettuccine Alfredo with chicken is an Italian classic that can be found on restaurant menus all over the United States. Although the two terms are often used interchangeably, fettuccine is actually the name of the pasta that is used in the dish and Alfredo is the name of the sauce. You can easily use any kind of pasta when making chicken Alfredo, but penne and fettuccine are the most common. Alfredo was created by Roman restaurant owner Alfredo di Lelio in 1914. When his wife became pregnant, she was constantly nauseous and struggled to keep food down. Lelio made his wife a plain dish of pasta tossed in butter and Parmesan. It became her “pregnancy food” and Lelio later added it to his restaurant’s menu. It was later introduced to the United States after two American actors visited Lelio’s restaurant and ordered the fettuccine Alfredo. They loved it so much, they asked for the recipe and brought it back to America. The dish took off in America, and Lelio’s restaurant became famous as well, but in Italy, fettuccine Alfredo is far less popular and is considered to be plain noodles tossed in butter. Other ingredients like milk, cream and cheese were later added to create the creamy Alfredo sauce that we know and love today. You can find several versions of fettuccine Alfredo in restaurants across the United States, but the most popular additions include broccoli, shrimp and chicken. It’s easily one of best-known pasta dishes we order at restaurants, but making pasta in your own kitchen can make for a simple, yet elegant dinner.